Monday saw a change in sentiment which continued all week. 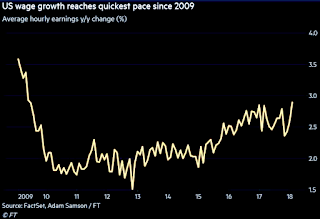 As the US 10-year Treasury yield climbed to its highest level in nearly four years, equities came off across the board, with SPX, DAX, NKY and FTSE all posting simultaneous red candles for the first time in a while. Notably AAPL was down 2% pre-earnings. The Personal Consumption Expenditure miss at 1330 didn’t help. In currencies, USD followed the bond yields (and Trump’s remarks last week), and turned up with DXY put on 0.3% on the day. Key DXY components EUR, JPY and GBP were down, whereas CAD and AUD were flat. Gold and Oil were down in line with the stronger dollar. 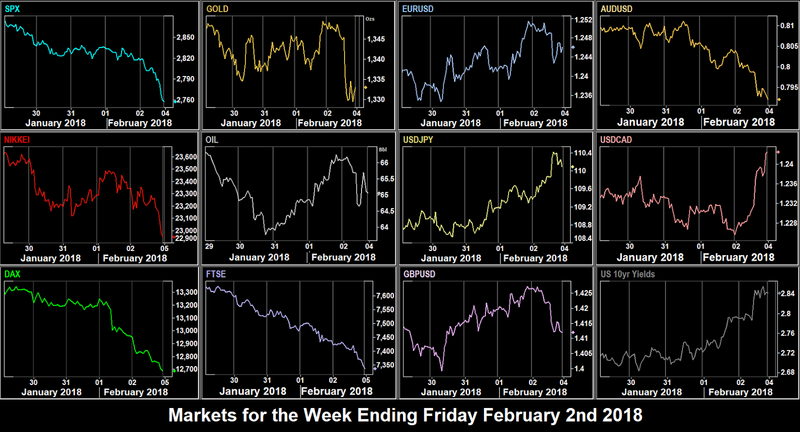 Tuesday was more of the same, with yields up again, Gold and Oil fading, and all indices continuing to fall. SPX had its worst day since August 2017. Healthcare stocks fell on news that AMZN, BRK and JPM were planning to set up their own company to take healthcare in-house. However, the trend was not the same with USD, which was down against all currencies except AUD. EUR was up 0.2% despite the German inflation (1300, reported later than scheduled) and Eurozone GDP (1000) misses. GBP briefly dipped below $1.40 before recovering to end the day up after bullish comments on UK growth by BoE Governor Carney. As the month closed, the equity rout was halted (temporarily, see later) on Wednesday despite yields once again posting a near 4 year high. SPX and DAX were flat, and NKY was up (on weaker JPY) but FTSE was down (on stronger GBP). DJIA was helped by a beat from BA, its largest component, which we mentioned last week. This pause may have also been partly to do with month end rebalancing, not any change in momentum, which we know is always stronger on the downside. The USD picture was mixed. DXY was flat, as was EUR, with the universally expected Fed rate hold at Chair Yellen’s final meeting at 1900 having little effect. As stated JPY was down, along with AUD (following the CPI miss at 0030), and GBP was up along with CAD. Gold and Oil changed direction and rose, the latter shrugging off the EIA stock miss at 1530. 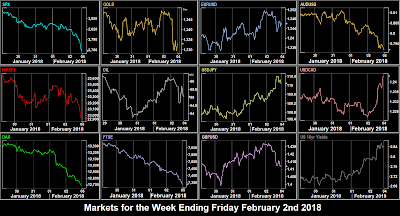 February started on Thursday, and the equity fade continued in all markets (ignoring the US ISM PMI/Prices Paid beat at 1500), with a particularly sharp fall of 1.82% (1.4% cash period) in DAX, after a strong EUR rally, which saw it break above $1.25, together with a rise to 0.71% in German Bund yields, the highest since December 2015. Only NKY managed to remain flat, due to JPY coming off. The US10Y was similarly up 7bp to another high, the best day for yields this year. With the exception of EUR, the currency and commodity picture was the same as Wednesday, AUD and JPY down, GBP and CAD, Gold and Oil up. Oil completed a V-shape for the week to return to roughly where it opened. We said last week that markets have been paying little attention to NFP, and so it was on Friday. 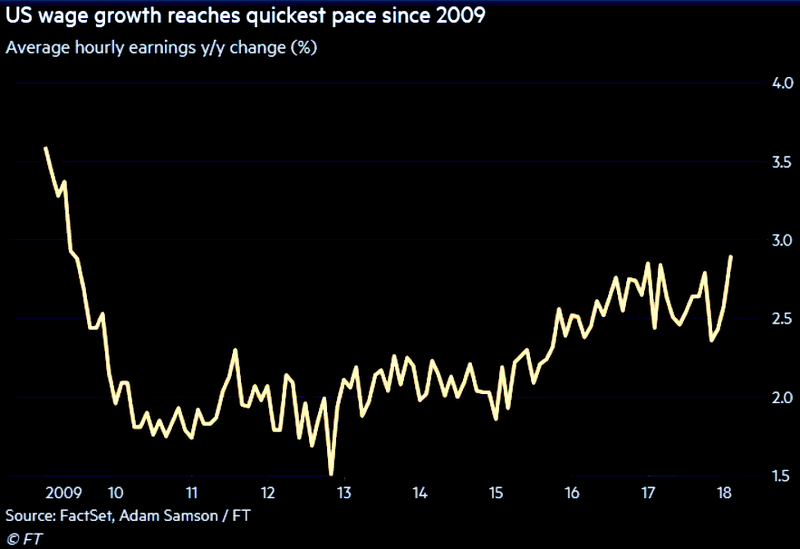 Not only did the headline figure beat at 1330 (200k vs 180k), but so did the all-important Average Hourly Earnings (2.9% vs 2.6%), no doubt linked to the ‘Trump Christmas Bonuses that we mentioned last week. It was the best monthly improvement since the crash recovery in 2009, as shown in this chart from Friday's FT.
AHE is of course the sticking point for rate hikes, so the print should be bullish for USD, and sure enough yields put on another 5bp, to post the best weekly candle since Trump election week, and another 4-year high. DXY also put on 0.63%, and was up against all currencies. It is surprising that the dollar was not up more, perhaps next week. CAD was even further off after a report that Canadian PM Trudeau had said he would “walk away” from a bad NAFTA deal, and the loonie ended the day down 1.25%, its worst day for over a year. A triple whammy for CAD; great US employment figures, falling Oil (down 1.39% on the day), and NAFTA. However, the big story of the day was the total rout in equities. DJIA fell 669.06 points (2.55%), its worst day in percentage terms since the Brexit vote, and in points terms since the 2008 crash. SPX fell 1.67%, ending the 17-month run without a 3% pullback, DAX fell 2.02%, NKY 1.36%, FTSE 1.32%. SPX and DJIA had their worst week in two years. Of course this is only to be expected given the price/action over the last few weeks and months. Following late Thursday earnings, AAPL and GOOG fell over 4%, but in a rare patch of green in a sea of red, AMZN was up 2.9% after a record profits beat. In the continually curious correlation between Gold and equities, the metal was down 1.32%, more than the dollar. The week saw a complete reversal in a year-long trend. Indices posted their worst week since Brexit, and DXY posted the first green weekly candle for two months. Only EUR held up, so the best forex trade would have been to buy EURAUD, up 2.54%. Shorting the DAX would have delivered 5.06%. Commodities were, surprisingly, relatively flat. Unusually, and as a consequence of the USD turn, EUR, GBP, NZD and JPY all posted inside weeks against USD, although not against each other. Cryptocurrencies had a terrible week, with many saying the bubble has truly burst. Bitcoin was down 32% at one point, below $8,000. At the time of writing it has recovered to $9,500. Over the weekend, German politicians are expected to finally conclude coalition talks, which may help the beleaguered DAX. Monday sees a raft of Services PMI reports, and like Manufacturing last week, the ISM print is the most important. There is a presentation by ECB President Draghi at 1600, but it is only concerning the ECB Annual Report. EU Brexit negotiator Michel Barnier meets UK Brexit Sec Davis in London for talks, although little news is expected on the day. Tuesday’s main event is the RBA rate decision, preceded by Australian Retail Sales and Trade Balance. The RBA is on record as saying it is not bound to follow the Fed, and commentators do not expect anything hawkish, given the weak last CPI release. A hold could push the currency further back down from the 0.80 psychological roundpoint. Elsewhere Fed Bullard (dove, non-voting) speaks at 1350 In Kentucky. Although New Zealand markets are closed, the milk auction results will be released sometime around the US open. After Australia, it is New Zealand’s turn on Wednesday (which is early Thursday local time). The decision is followed an hour later by a press conference. Traders are looking for revised inflation projections following the December CPI miss. There is also a rate decision in India at 0900, 6% hold expected. Fed speakers are Kaplan (neutral, non-voting) at 1100, Outgoing member Dudley (neutral, voting) at 1330, Evans (dove, non-voter) at 1515, and Williams (hawk, voter) at 2220. TSLA earnings are released after the US bell. Thursday’s main event is the fourth rate decision of the week, with the BoE decision at 1200. An unanimous hold vote is expected. GBP has of course largely recovered to a pre-Brexit level, and any dovishness now must surely cap its recovery. The continuing shutdown farce in the US continues. Today is the next expiry date. How long can Congress kick this ball into the long grass. ECB speakers today are Weidmann (hawk) at 0845, Villeroy (neutral) at 1015, Mersch (hawkish) at 1030, and Praet (dove) at 1045. Earnings season is coming to an end now, the only interesting ones (after the US bell) are TWTR and NVDA, the latter being the manufacturer of the GPU chips that power cryptomining. Friday’s big event is the Canadian jobs report. It is unlikely to beat last month’s bumper 78.6k, but the estimate (at time of writing, watch for changes) is once again a lowly 10k, which will surely be beaten. We will have to see where CAD is after a week when NAFTA will be in the news. There is no US news at the same time (their NFP was last week), so the effect should be more muted than usual. Also important is the RBA quarterly statement on Monetary Policy, which includes inflation and GDP forecasts. CB speakers today are Fed George (hawk, non-voter) at 0200 and BoE Cunliffe (dovish) in California, so towards the end of the session. A fifth rate decision for the week, the CBR is expected to cut the RUB rate by 0.25% at 1030, given the sharp fall in Russian inflation.